This easy meal is ready in 20 minutes and tastes even better than takeout! Budget friendly, simple to prepare, and makes plenty for leftovers the next day! Last week, my mom went to her friends house for dinner. When she got home, she immediately text me to tell me how tasty dinner was. She even took several pictures and brought home the recipe! Knowing I would want it, she passed it my way and after one look at the pics, I knew I had to share! 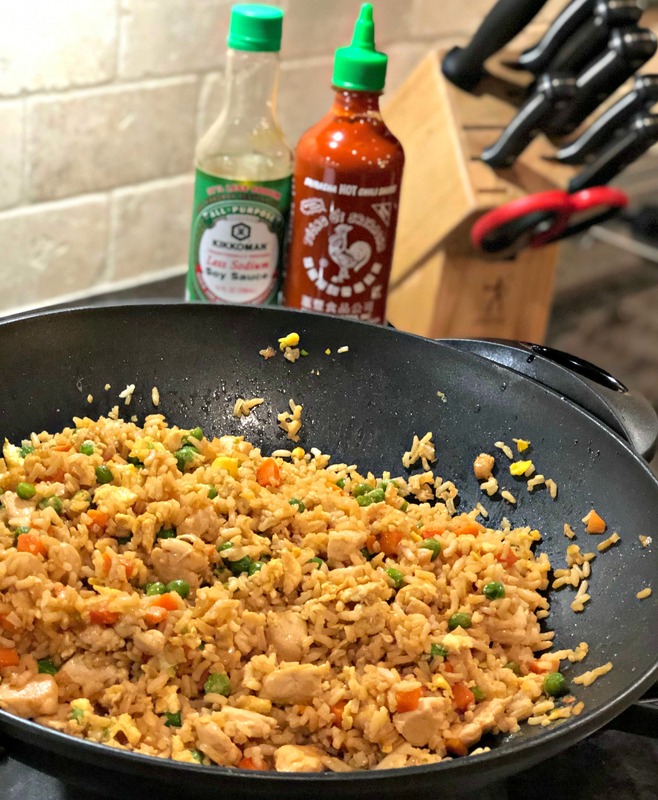 I LOVE Chinese food and one of my favorite dishes to order is simple chicken fried rice! Nothing better than an order of that with a side of egg rolls, right?! Well, since I already have a baked egg roll recipe, I can’t wait to make this rice and have a complete at home meal! Not only does it allow me to not have to load the entire family up and go to a restaurant, but it also is budget friendly, kid friendly, and based on the recipe….makes plenty for leftovers the next day! 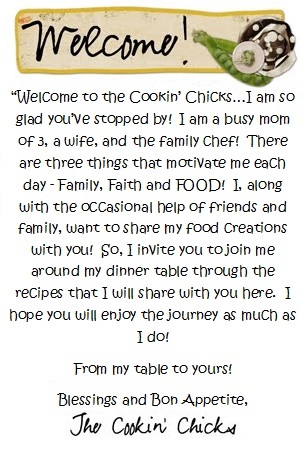 Thanks mom for snagging the recipe for me and thanks Christi for sharing!! 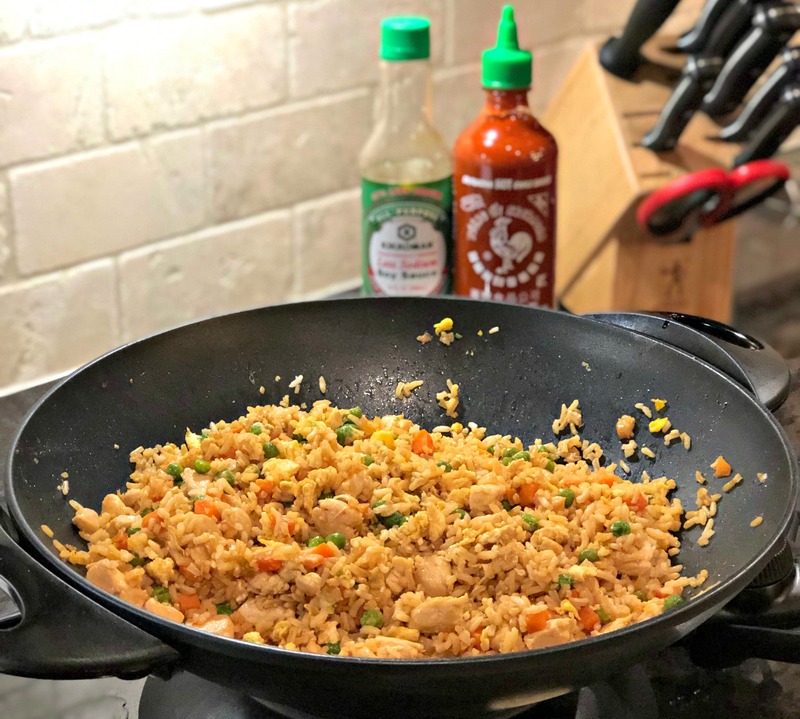 Check out the Chinese recipes below that my family enjoys for more ideas of options to serve with this fried rice! Forget going out for Chinese food! You can make this at home dish and save on time, budget, and have plenty for leftovers! 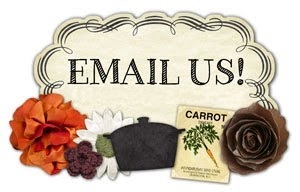 Preheat a medium skillet or wok to medium heat. Add the sesame oil, onion, and peas/carrots. Allow to cook until tender. Slide the onion, carrots, and peas to one side of skillet and add in the lightly beaten eggs to the other side. Once eggs are fully cooked, combine with the onion/peas/carrots. Add the cooked rice and shredded chicken into the skillet and combine with the egg mixture. Pour the soy sauce on top and stir to combine evenly. Add in the green onions, if using. Serve! Wonderful, wonderful! It is best to make the rice 24 hrs in advance then bring to room temp before adding. I have made this for years. My question is in the picture I see a jar of Sirracha but it is not in the recipe. That is why I brought up the recipe. 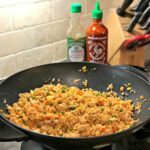 Do you use the Sirracha in the recipe? 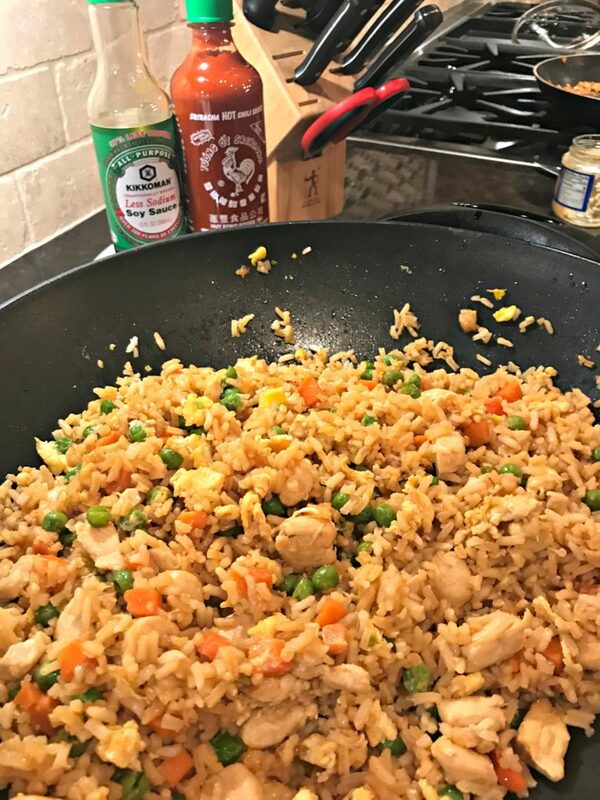 Nope, typically the recipe doesn’t call for the Sirracha in it, however, I love adding a splash on mine for a bit of a kick! Making it tonight. Using it as a guide. I make the same thing all the time but I have never put an egg in it,what is the purpose of adding egg? Question do you add the chicken in as uncooked? Nope, the chicken is pre cooked and shredded prior to adding it! Enjoy!! Personally, I cook my chicken in my slow cooker with some salt/pepper on top so its shredded. You can also boil, bake, or grill. I prefer shredded chicken in this. Fried probably wouldn’t be a good fit as its crunchy and being a rice dish, may be too much! Enjoy! I use both Jasmine and Long Grain when I make this. Both types are great! I haven’t used brown, but other than it cooking a bit longer, should be tasty as well!